A 34-year-old man has been arrested and a woman taken to hospital following an incident in Cardiff. 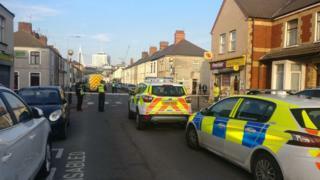 Police were called to Stafford Road in Grangetown at about 14:15 GMT. A 26-year-old woman has been taken to University Hospital of Wales in the city, although her injuries are not believed to be life-threatening. It is believed those involved are known to each other, and police inquiries are continuing in the area.